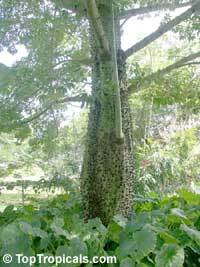 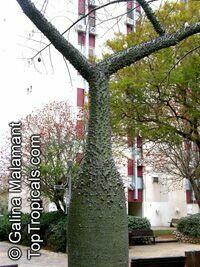 The trunk becomes bottle shaped as it ages, and it is covered with stout spines, more decorative than really frightening. 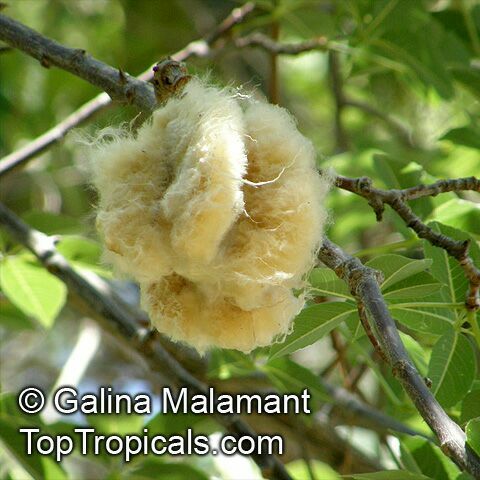 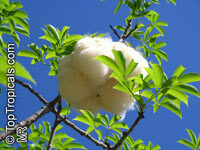 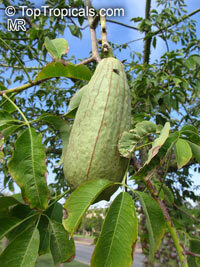 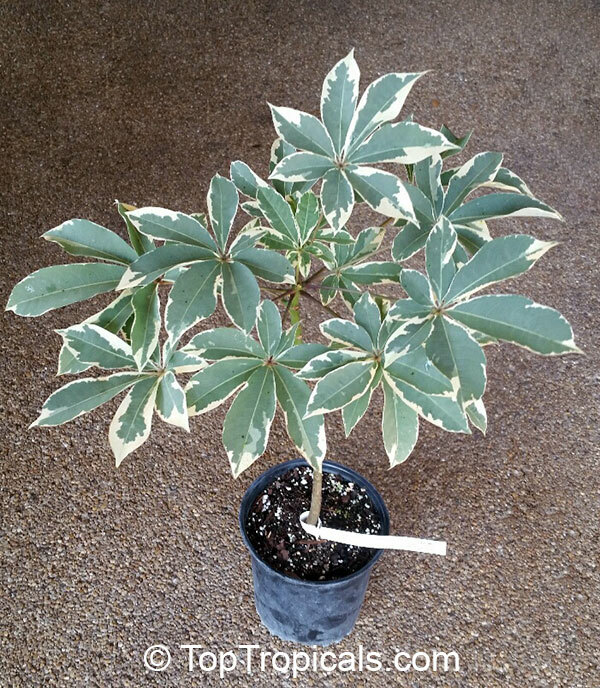 Can make a shade tree in warmer areas, or an interesting patio tree. 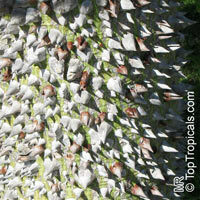 Many bonsai them in large pots. 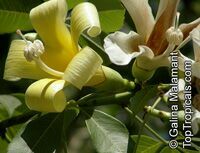 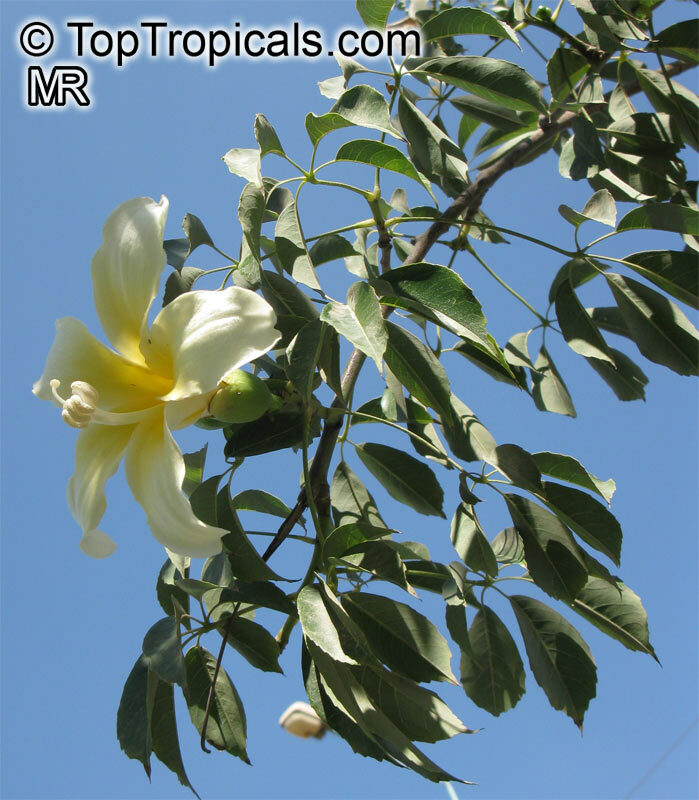 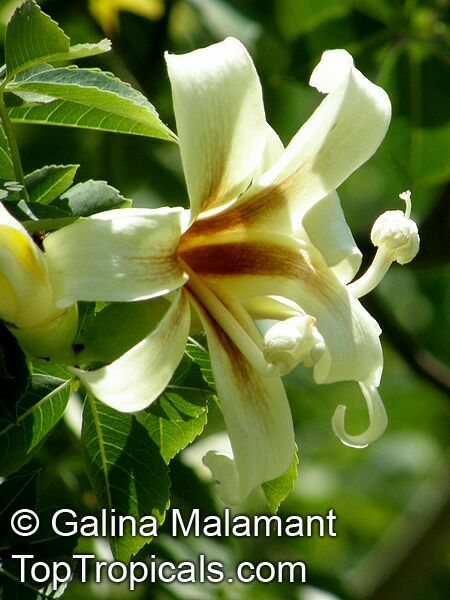 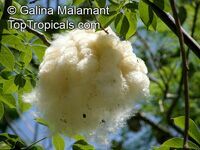 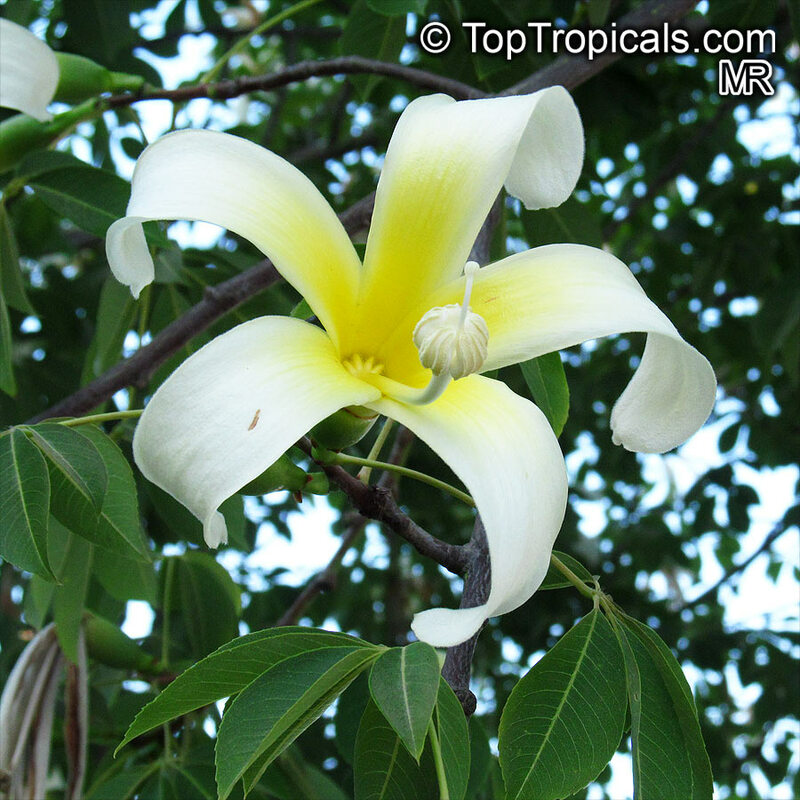 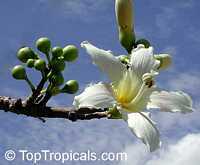 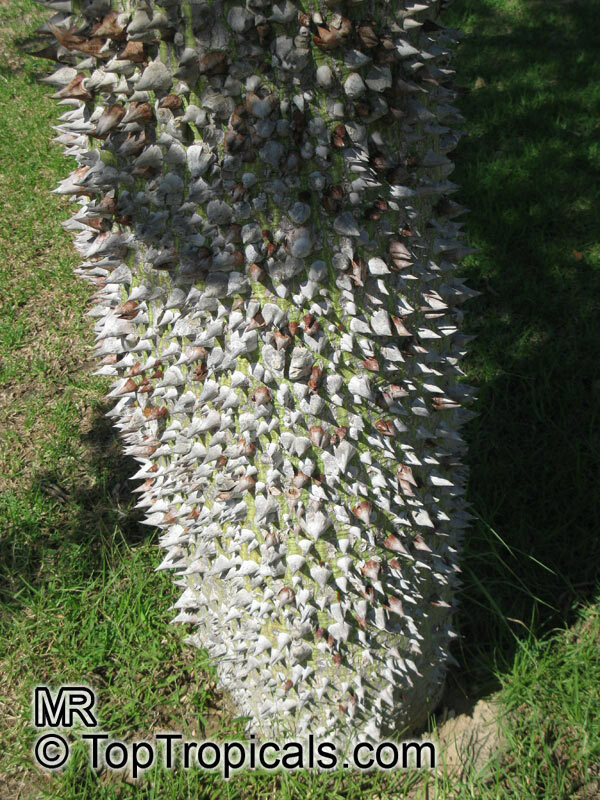 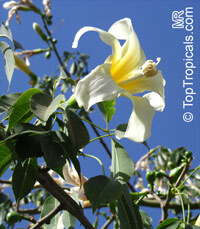 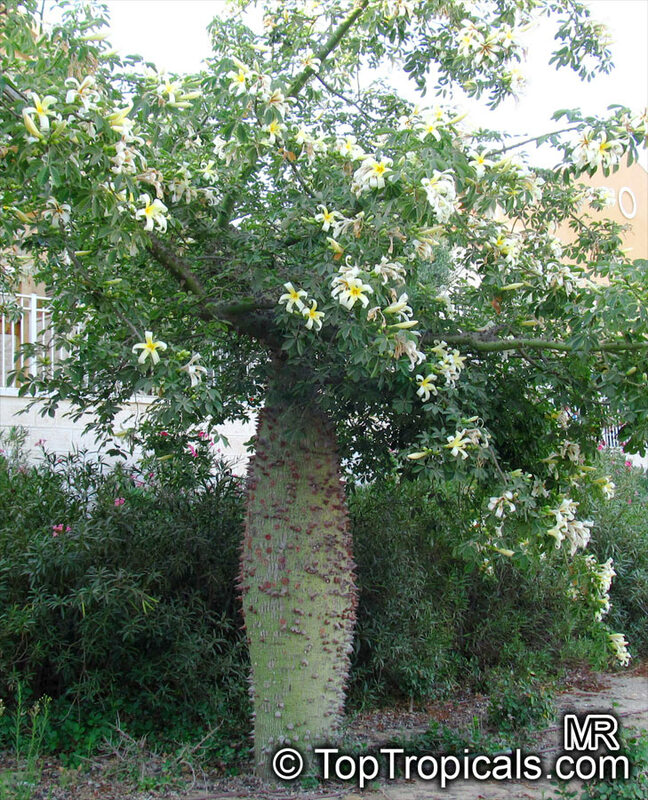 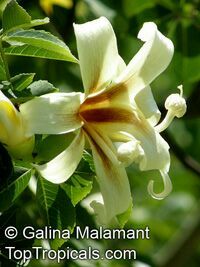 In deep soil this can become a good shade tree, otherwise it is grown for its spectacular flowers and interesting shape. 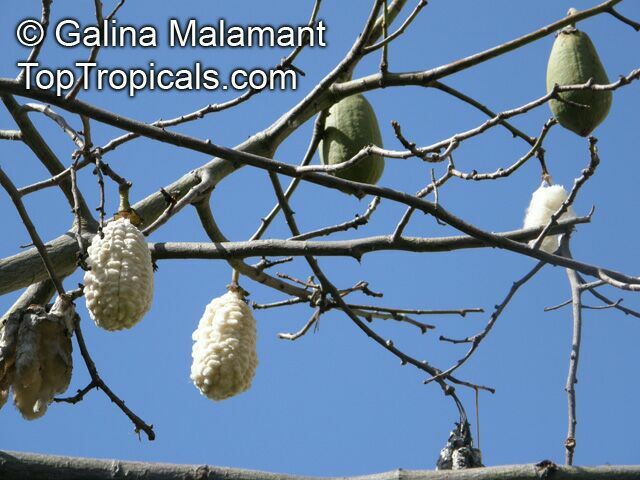 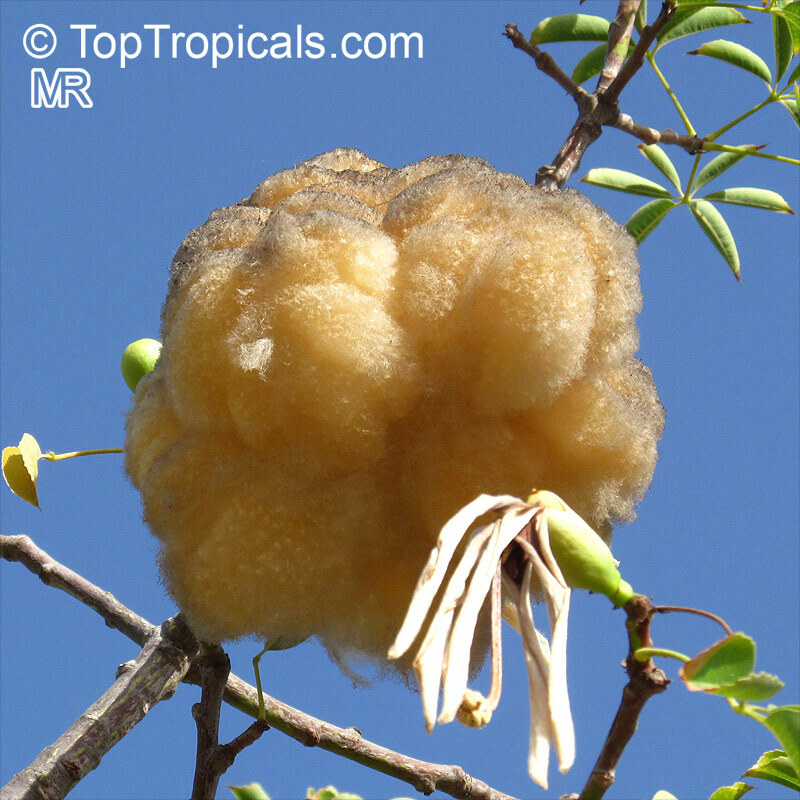 Pear shaped fruits containing a silky floss coming out of the seeds. Need a good drainage. Abundant water in the growing season can make a large tree quickly as they have been recorded to grow 5 meters (15 feet) a year in optimum conditions. 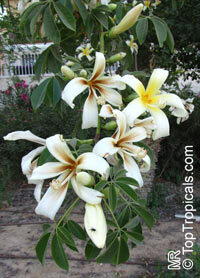 Hardy to about 20 degrees F, although hardiness varies with individuals. Spikes only on one side of this trunk. Sometimes they are scattered sporadically. 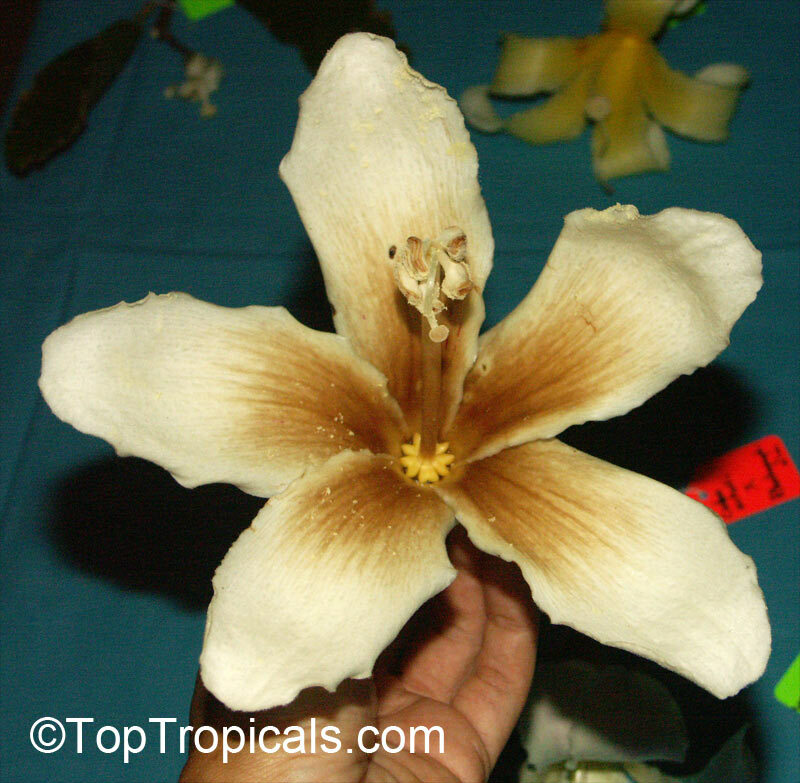 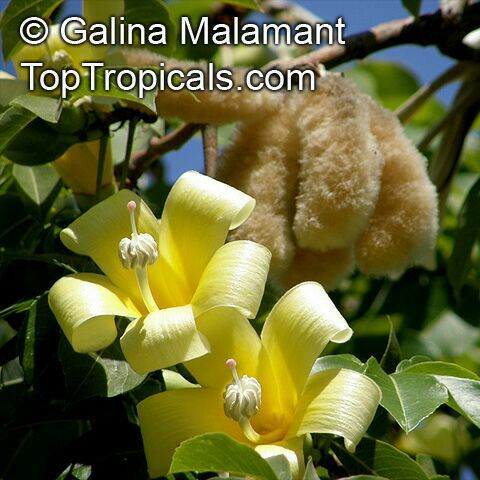 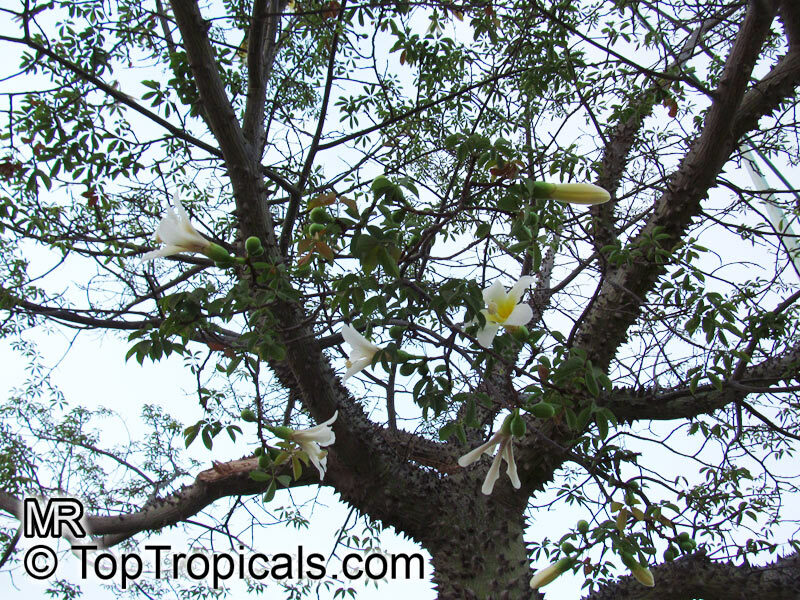 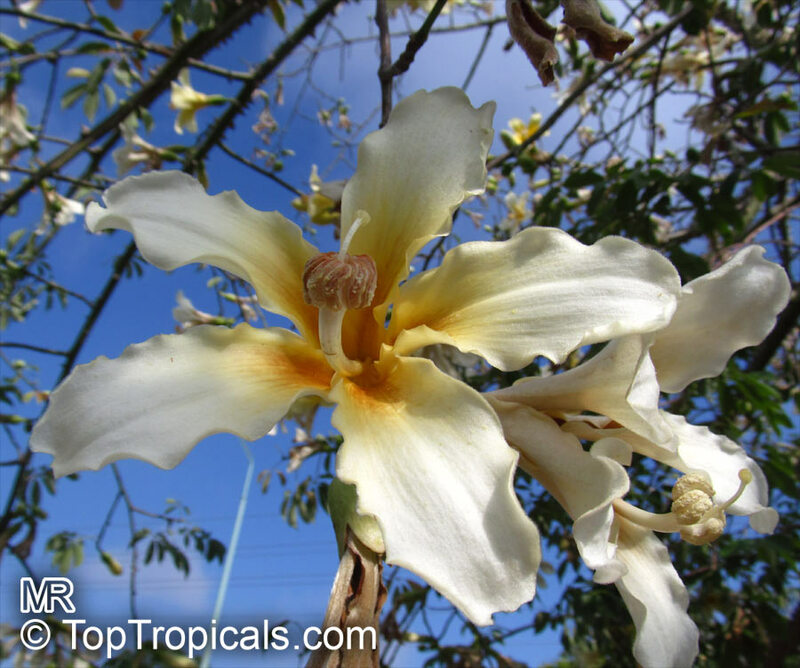 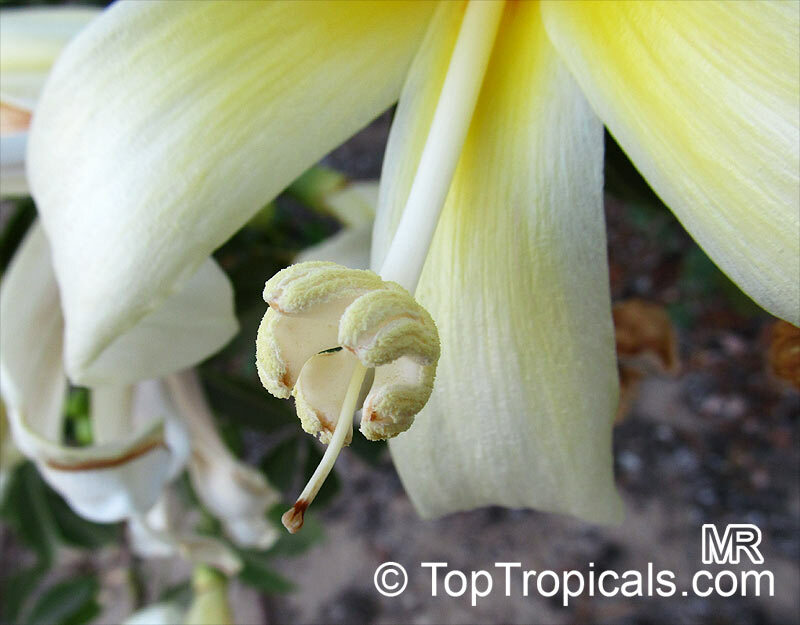 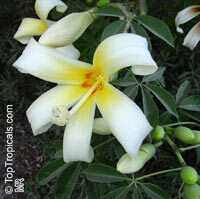 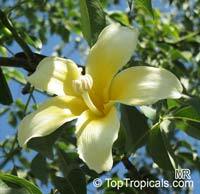 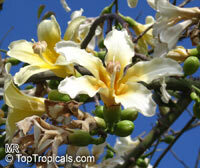 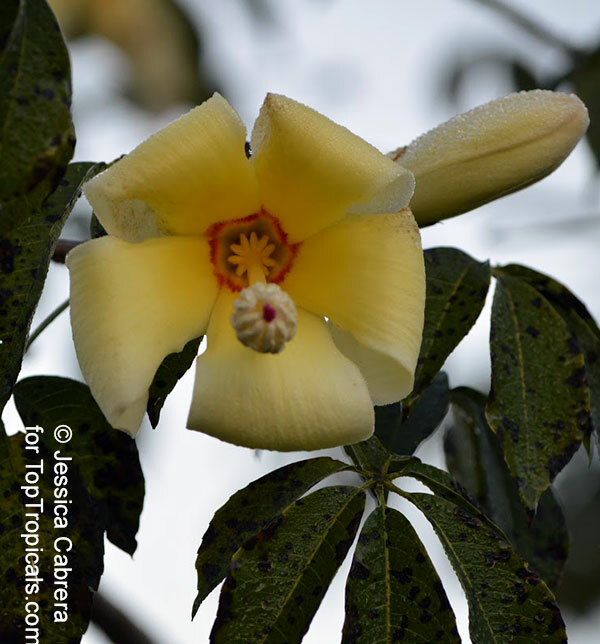 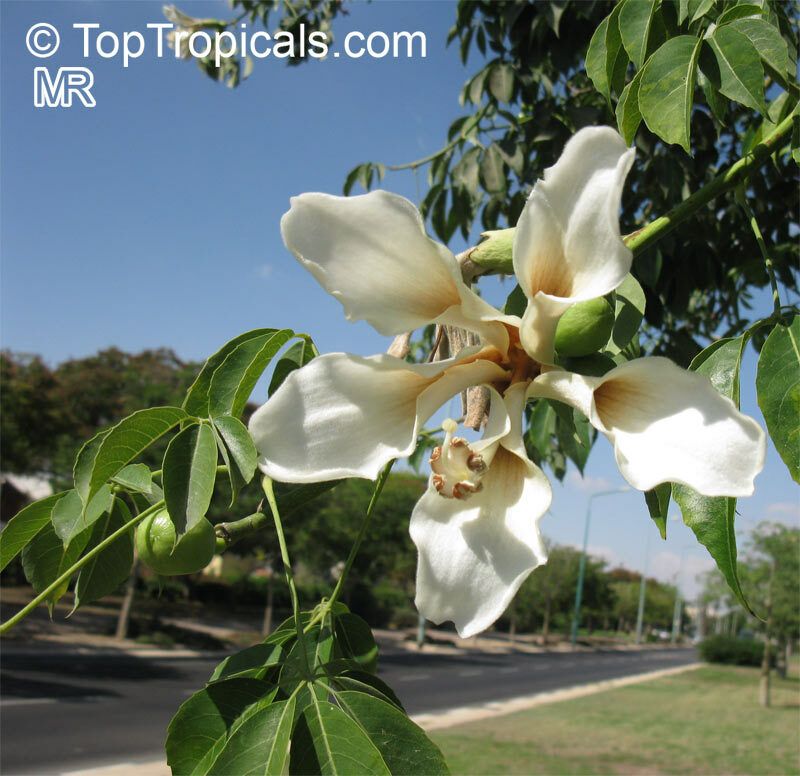 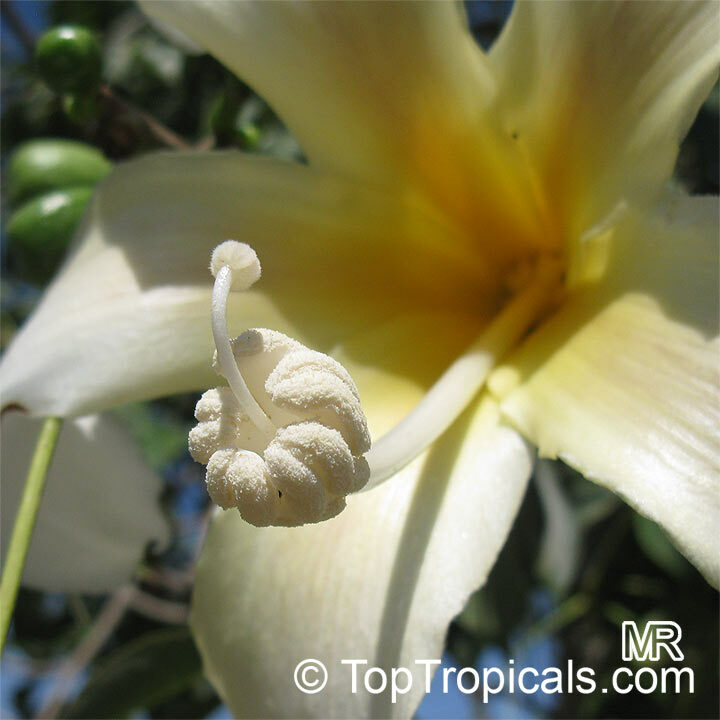 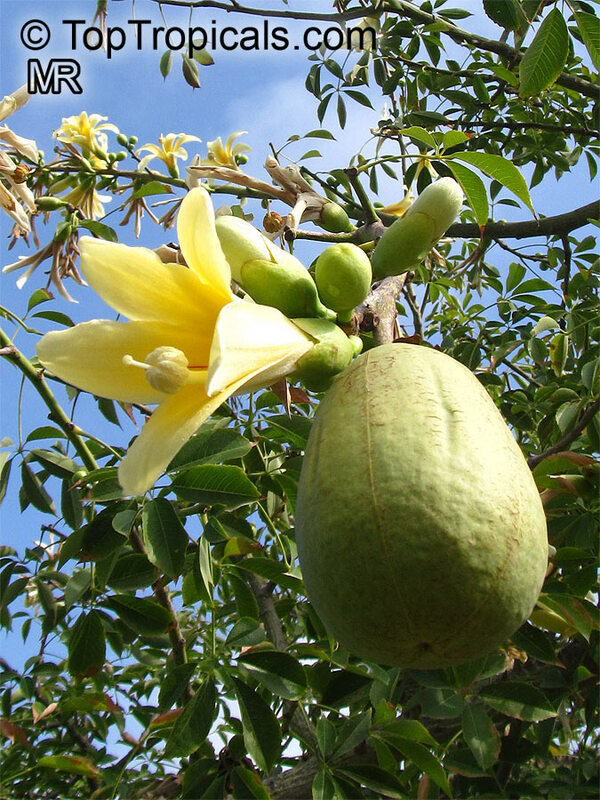 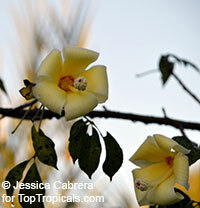 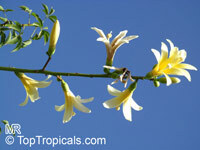 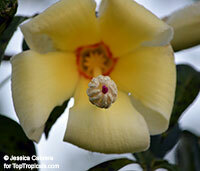 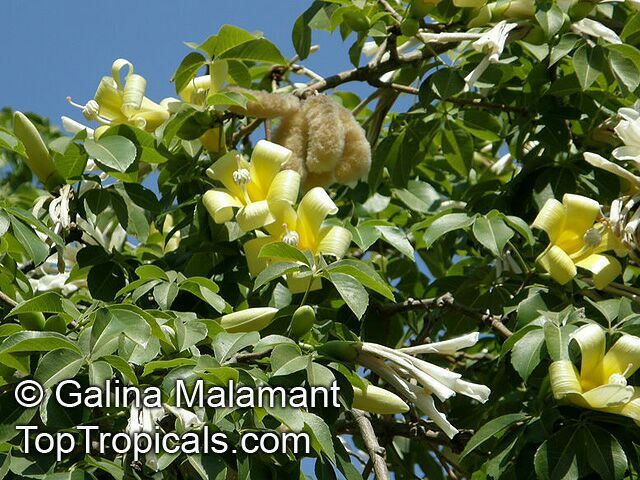 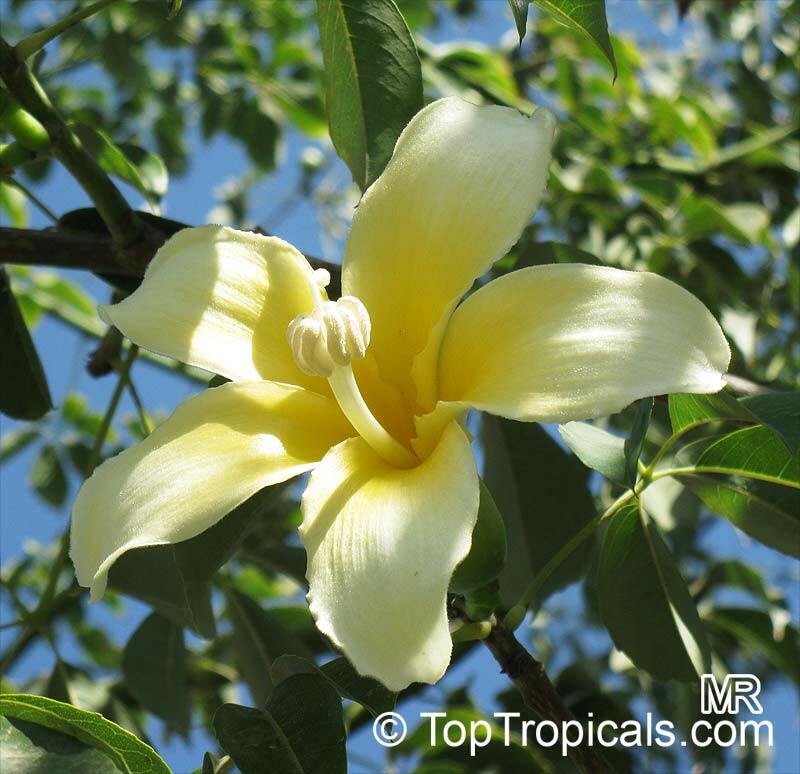 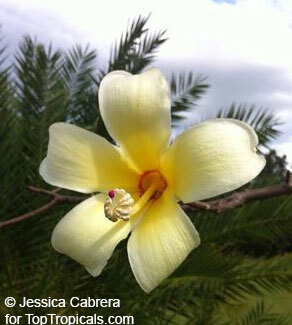 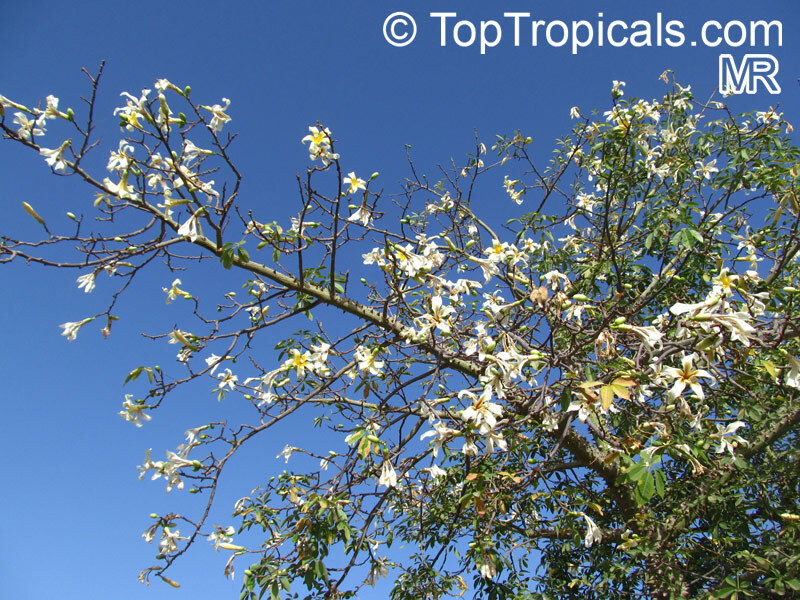 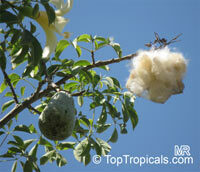 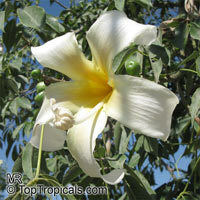 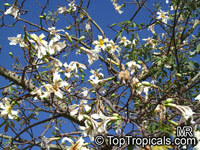 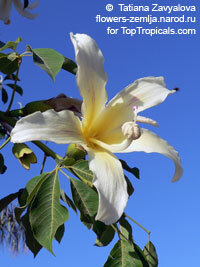 onto Ceiba pentandra.This item is certified for shipping to California. 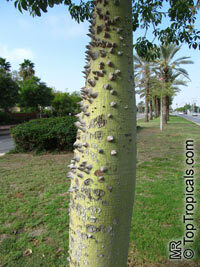 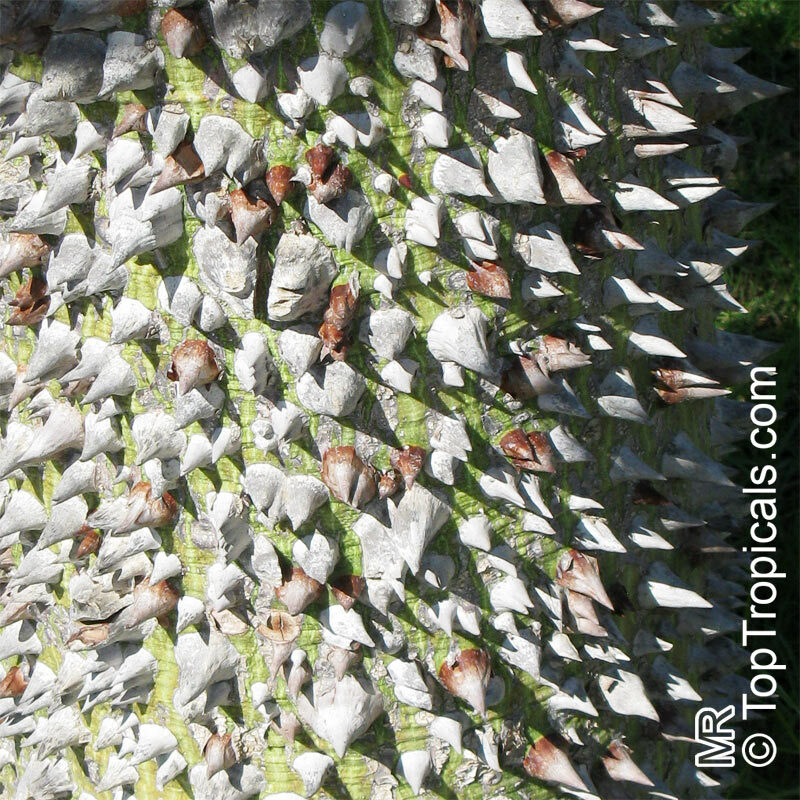 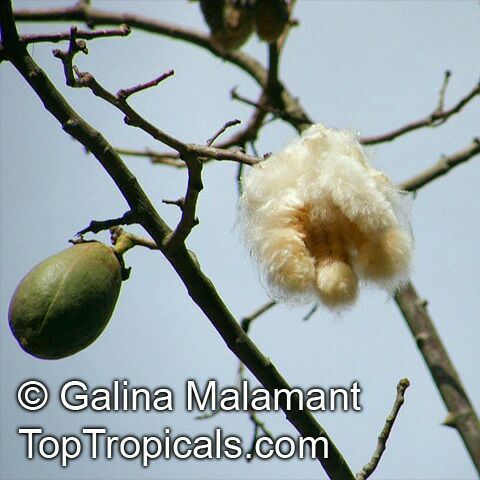 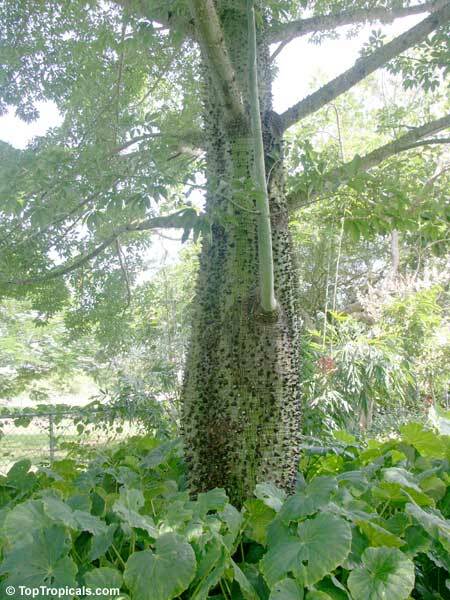 White Floss Silk Tree, Drunken Tree. 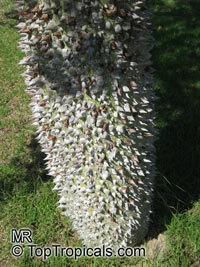 Rare species. 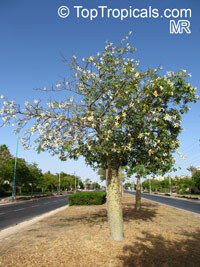 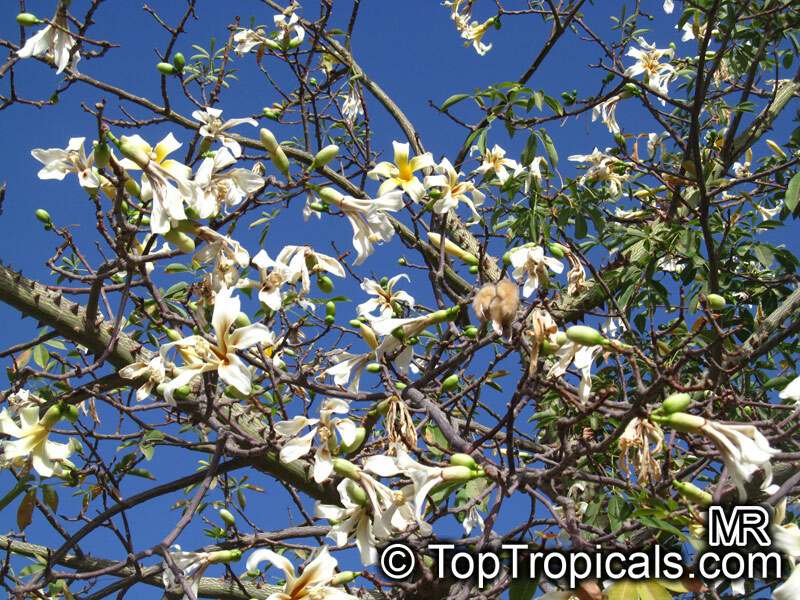 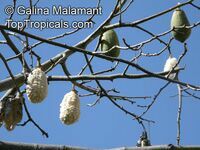 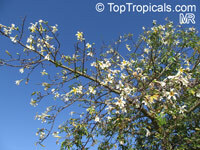 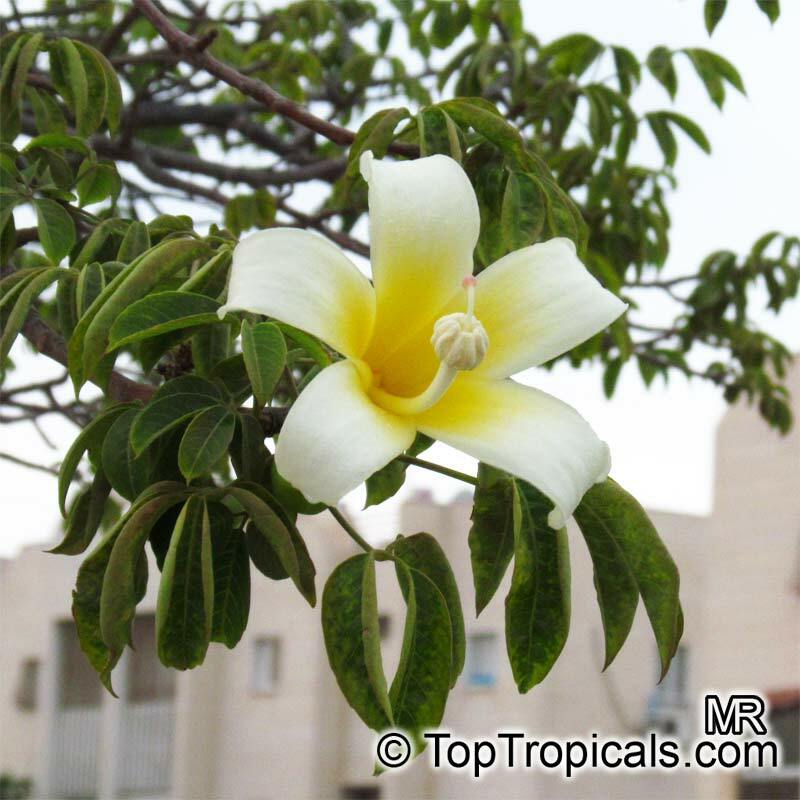 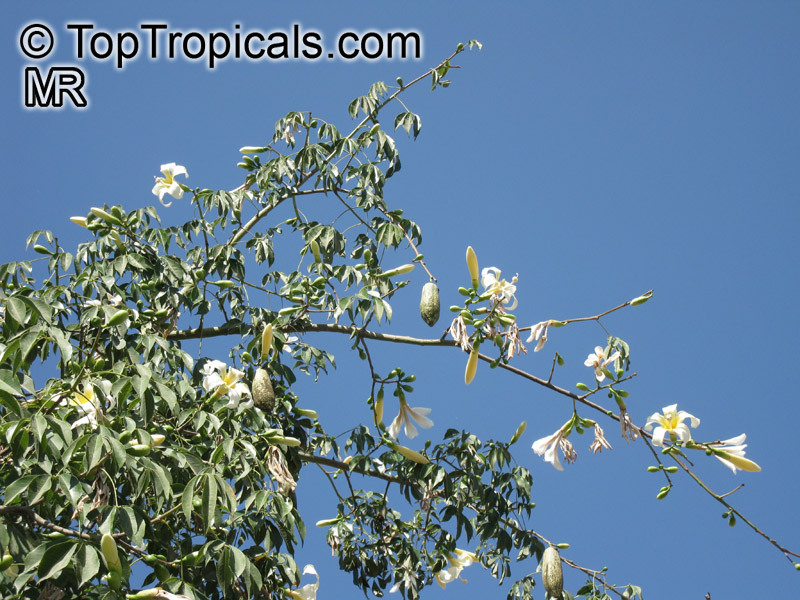 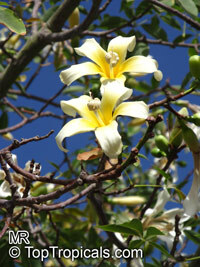 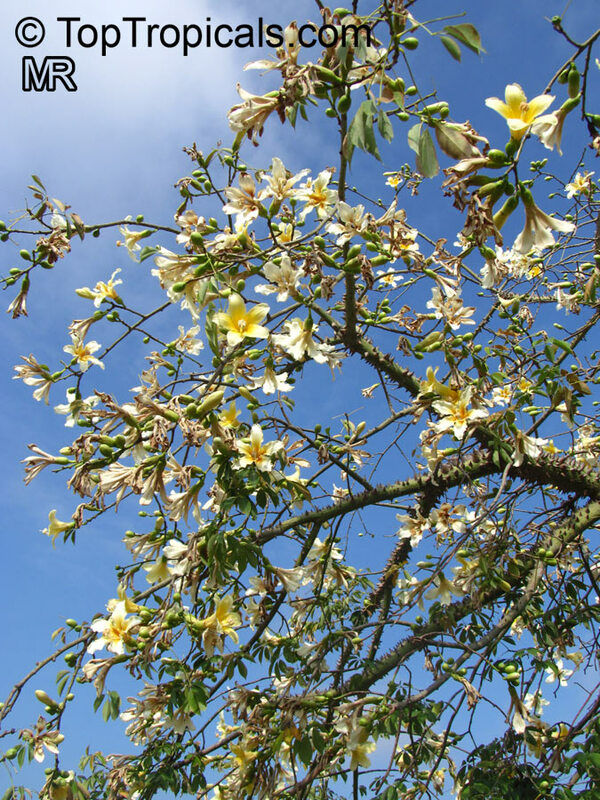 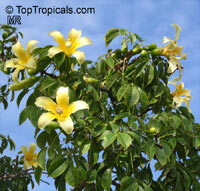 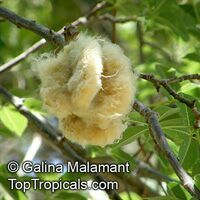 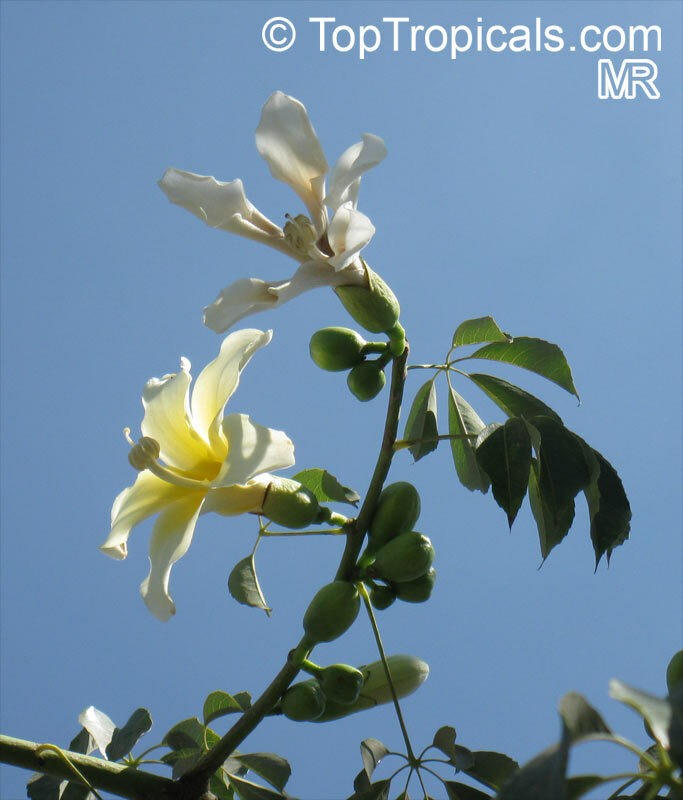 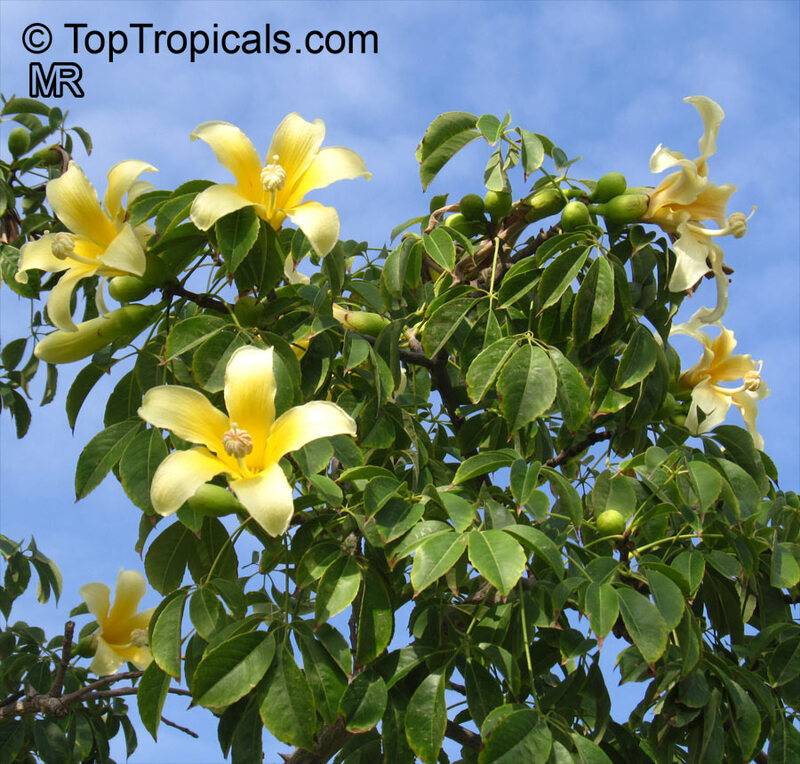 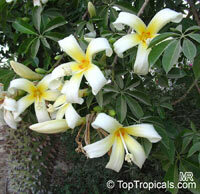 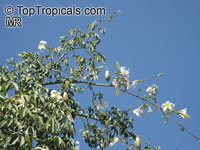 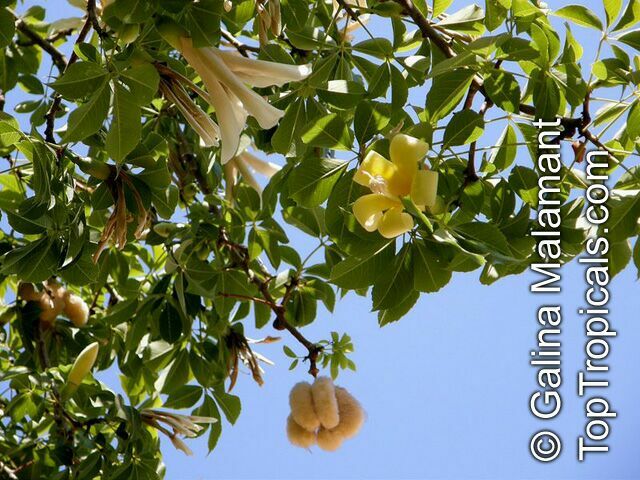 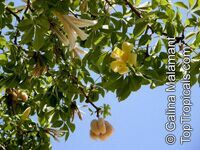 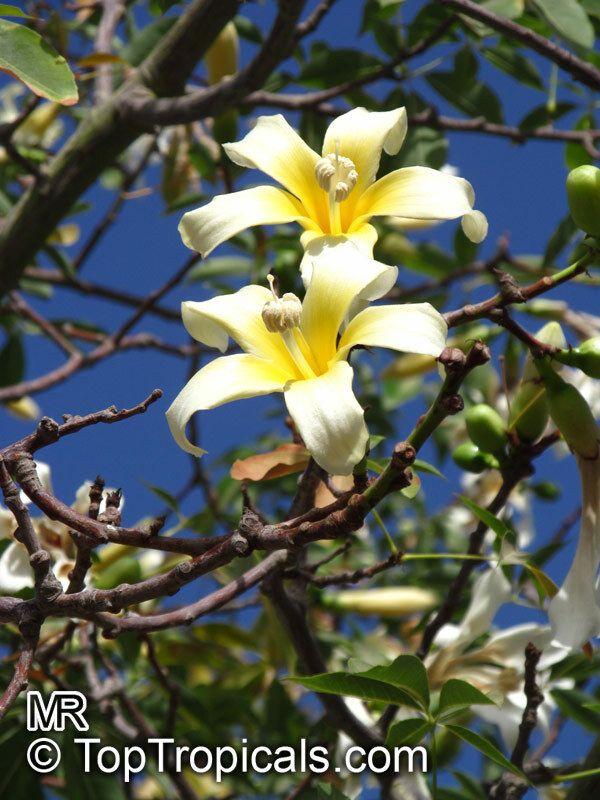 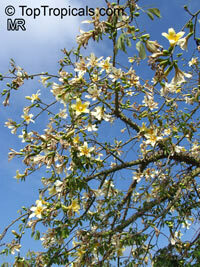 Large specimen tree with large off-white flowers with yellow to peach centers. 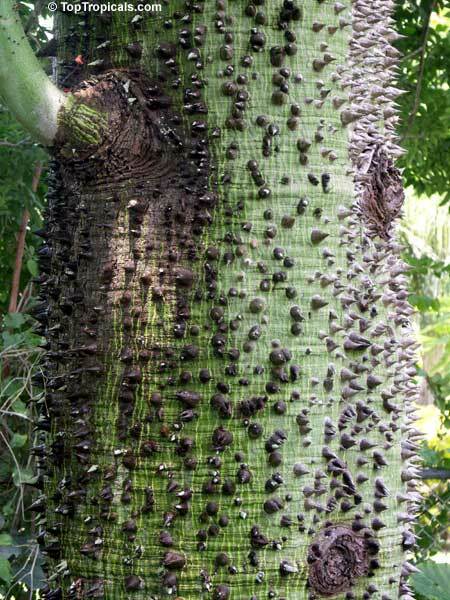 The trunk becomes bottle shaped as it ages, and it is covered with stout spines, more decorative than really frightening. 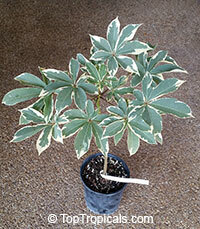 Can make a shade tree in warmer areas, or an interesting patio tree. 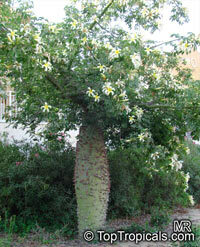 Many bonsai them in large pots. 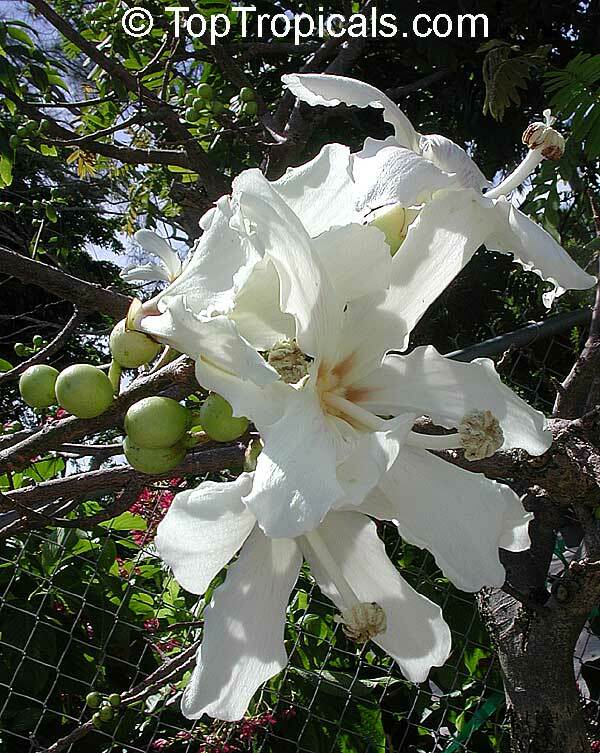 In deep soil this can become a good shade tree, otherwise it is grown for its spectacular flowers and interesting shape.This item is certified for shipping to California.